Screenwest, in partnership with DADAA, proudly supported THE OTHER FILM FESTIVAL, held last month at DADAA’s Fremantle cinema. The diversity-focused film festival held from the 5th to 7th October, was fully accessible, audio described, open and closed captioned and Auslan interpreted. The disability-led program of film screenings, screen industry panels and discussions, included diverse screen practitioners and industry. Insightful panel conversations generated in line with Screenwest’s Diversity, Equity & Inclusion Plan and organisational policy enabled discussions around three of the four focus areas for diversity within the WA Screen Industry: Skills Development Panel (behind the camera); Authentic Casting Panel (in front of the camera); Story Development Panel (Key Creatives). The opening night skills development panel highlighted the incredibly positive mentoring experience that the Screenwest Diversity Fund assists. Filmmakers from diverse and underrepresented groups are supported to overcome barriers to participate in professional screen industry activities. 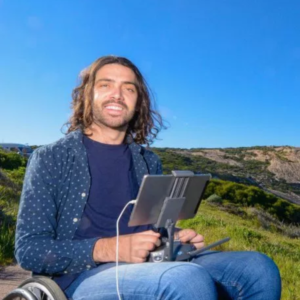 Jaimen Hudson, a regionally-based drone camera operator/filmmaker, who acquired quadriplegia through a motorbike accident in his late teens, is one example of how specific diversity funding programs help overcome barriers to the industry. Jaimen worked with Sea Dog International TV to design a mentorship and skills development program to help him attain the skills needed to further his career. Speaking at The Other Film Festival, Jaimen recounted some of his experiences being mentored by a production company of the calibre of Sea Dog International TV. Leighton De Barros talked about the impact Jaimen had on the production company. “We helped Jaimen because ‑ I think the biggest thing being in the regions – you don’t get that support, there’s no networks. He’s doing wonderful stuff all of his own accord and we thought we should give him a hand. Sea Dog International TV and Jaimen plan to work together again, with a project already in the pipeline.